This image was inspired and designed by a nursing mom. Me! It speaks of overflowing love, and the need to remember to take care of ourselves in a busy day for the sake of our health and the well-being of the entire family. approx 2.5" across. "Mother's Milk comes from the heart center with nourishment, warmth and love. A life sustaining gift you bring your little one. Remember the importance of caring for yourself as well as your baby during this special bonding time." I didn't review/rate this when I first bought the sculptures so I am doing it now. Your artwork is AMAZING! I love every sculpture and if I could I'd buy you out! 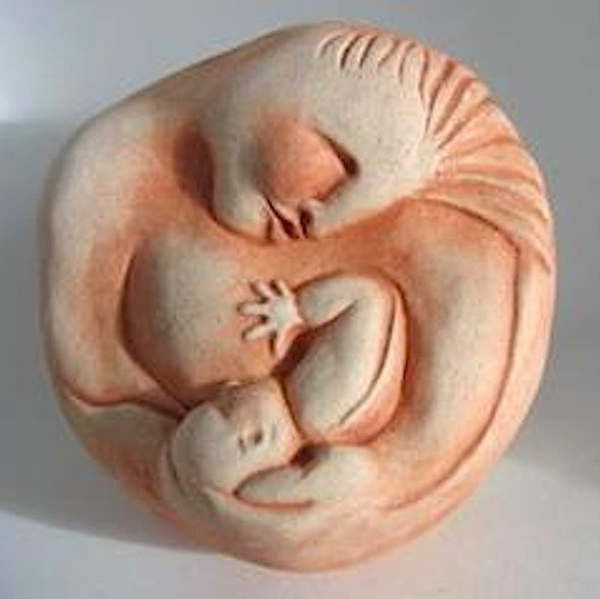 This particular sculpture I bought for my mom shortly after she gave birth and was breastfeeding. She, and I, absolutely love it. Amazing artwork and so much heart in every piece. Thank you so much.